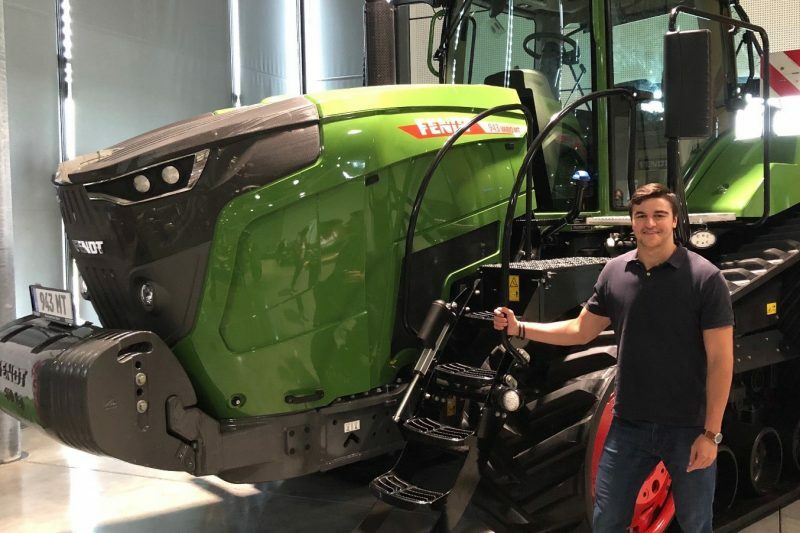 Summer in Germany Mark Donohue '19 spent the summer working as a software engineering intern at a company called AGCO, located in southern Bavaria. Mark Donohue stands with one of the agriculture machines for which he wrote software. Please tell us about the work you’ve been doing in Germany this summer. I worked as a software engineering intern at a company called AGCO, located in southern Bavaria. They are an agriculture firm (I know, it is a weird combination, software and agriculture, but nevertheless an interesting one). I helped write some of the software that collects data from AGCO machines—and, in some cases, controls them. What made this internship possible for you? The support from Professor Youngman and the German department at W&L made the internship possible, as well as the German American Exchange, the organization responsible for organizing all of these internships. What does an average day for you look like on this project? Usually, I have a meeting with my boss in the morning where I update him on the work I have been doing. I’ll work throughout the day. In the afternoon, I’ll have another meeting with AGCO employees around the world and discuss the software changes that my team has implemented. Has it been challenging in any way? If so, how? Trying to understand my coworkers on a daily basis was definitely the most difficult part. Not only do they speak German at an unreasonably fast rate, they also speak in the dialect of the region, which sounds nothing like regular German. Yes. Although my first choice would be to work in the U.S., the experience has opened up the idea of possibly working in Germany. For starters, I started learning German at W&L, and this internship would not have been possible without any knowledge of German. Secondly, the German department and Career Development made sure that my application for the program stood out. I’m a member of Phi Zeta Delta, I work in the IQ Center, and I sporadically play on the club hockey team. I came to W&L with absolutely no idea in what I wanted to major. On a whim, I took a computer science class my sophomore year. I really liked the subject and the career opportunities it could provide, so I stuck with it. As for German, I had actually forgotten to take the Spanish placement test before my freshman year. Still needing to fulfill the language requirement, I decided to take a German class. Since then I’ve taken at least one German class every semester, and that is primarily because of the professors within the German Department. They are some of the best that W&L has to offer. Professor Youngman. He encouraged me to pursue this internship and helped me throughout the application process. Muchacho Alegre. Chicken quesadilla or the enchiladas. I can hit the high notes in “Hello” by Adele.